The United States Congress designated the Clifty Wilderness (map) in 1985 and it now has a total of 12,371 acres. 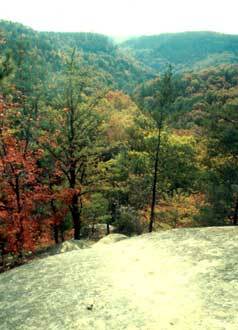 All of this wilderness is located in Kentucky and is managed by the Forest Service. Clifty Wilderness is a rugged area characterized by miles of high cliffs, steep valleys, numerous sandstone arches, rock shelters and boulder-strewn creeks. This Wilderness is located within the scenic Red River Gorge Geological Area, where cliffs tower 200 feet above the mature hemlocks, hardwoods and rhododendron thickets. This unusual geology has created an environment for abundant wildlife and more than 750 flowering plants. An added feature of this Wilderness is the Red River, a National Wild and Scenic River that bisects the Wilderness. Backpacking, primitive camping, canoeing, fishing and hunting are popular activities in Clifty Wilderness. Planning to Visit the Clifty Wilderness? How to follow the seven standard Leave No Trace principles differs in different parts of the country (desert vs. Rocky Mountains). Click on any of the principles listed below to learn more about how they apply in the Clifty Wilderness.